"It’s clear that we’ve got a lot of work to do in the province." NDP Leader Jagmeet Singh speaks to reporters in the Foyer of the House of Commons on Parliament Hill in Ottawa on June 19, 2018. 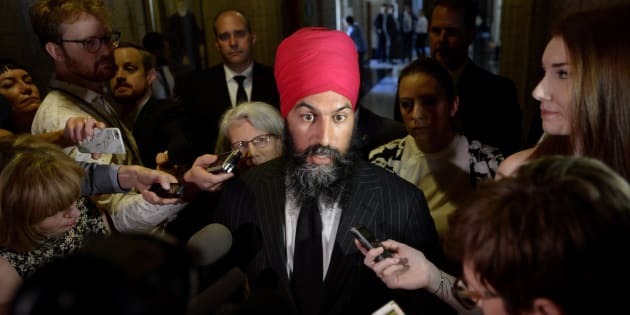 OTTAWA — NDP Leader Jagmeet Singh said Tuesday that crises including harassment complaints and the collapse of party support in a Quebec riding have made it a "tough session" of Parliament. The Conservatives' high-profile candidate Richard Martel won Monday's byelection in Chicoutimi-Le Fjord, snatching the seat from the Liberals. The Liberals won the riding from the NDP in 2015. "Well it's clear that the results are disappointing. It's clear that we've got a lot of work to do in the province," Singh said, adding the party focused on issues including Netflix, culture and internet giants to engage Quebec voters. Conservative Leader Andrew Scheer, right, and Saguenay-Le Fjord candidate Richard Martel chat as they visit the famous Boivin cheese counter on June 14, 2018 in Saguenay, Que. Singh, who currently does not hold a House of Commons seat, told reporters that last year's NDP leadership race was a factor in distracting the party from organizing a winning campaign in Chicoutimi-Le Fjord. "We had a period time where we had a leadership race and that takes away from your ability to have a clear leadership in directing the work," Singh said. Singh became leader of the federal party at the end of September. When pressed that the Conservatives also held a leadership race — and won the Quebec byelection — Singh explained it's one example of a "number of issues" the party faces in the lead-up to next fall's election. "It's clear that this result is problematic. This is not something that is acceptable." Chicoutimi-Le Fjord was swept by the NDP orange wave in 2011, with 38 per cent of the vote. In 2015, the party narrowly lost the riding to the Liberals, but still retained 30 per cent support. On Monday night, NDP candidate Éric Dubois picked up 8.7 per cent of the vote. Not only was it a devastating night for the NDP, it also marked the first byelection loss of a Liberal riding since Justin Trudeau became leader of the federal party in 2013. Conservative Leader Andrew Scheer chalked the byelection win to the result of six months of campaigning by Martel and "over a year of work" from his team to develop a plan to grow the party's appeal to a broader base of Quebecers. "Clearly yesterday was a great night for us, we haven't won that seat since the '90s," Scheer said. Quebec Liberal MP Anthony Housefather told HuffPost Canada the Conservatives' chances were buoyed by a "very well known" candidate to locals. Despite the previous night's Conservative victory, he said he's confident the Liberal message has become "stronger" elsewhere in the province. "I don't think it's particularly reflective of what will happen in Quebec in the next general election."